Spain threatened on Wednesday (11 October) to suspend Catalonia’s autonomy if the region follows through on its threat to break away as an independent country. Prime Minister Mariano Rajoy has vowed to do everything in his power to prevent Catalan secession following a banned referendum in the region, which remains deeply divided over independence. He held an emergency cabinet meeting after Catalonia’s President Carles Puigdemont announced on Tuesday that he had accepted the mandate for “Catalonia to become an independent state”, but immediately put it on hold and called for talks with Madrid on the country’s worst political crisis in decades. Catalan leaders signed a declaration of independence from Spain on Tuesday (10 October) but immediately put it on hold and called for talks with Madrid on the country’s worst political crisis in decades. Rajoy asked the Catalan leader to clarify whether he had actually declared independence, which could trigger moves by Madrid to suspend the region’s semi-autonomous status. The Catalan crisis is Spain’s most serious political emergency since its return to democracy four decades ago. World leaders are watching closely and continuing uncertainty over the fate of the region of 7.5 million people has damaged business confidence. “The cabinet agreed this morning to formally ask the Catalan government to confirm whether it declared independence,” Rajoy said in a televised address after emergency cabinet talks. Rajoy could choose to trigger constitution article 155, which allows Madrid to impose control over its devolved regions — a move many fear could lead to unrest. 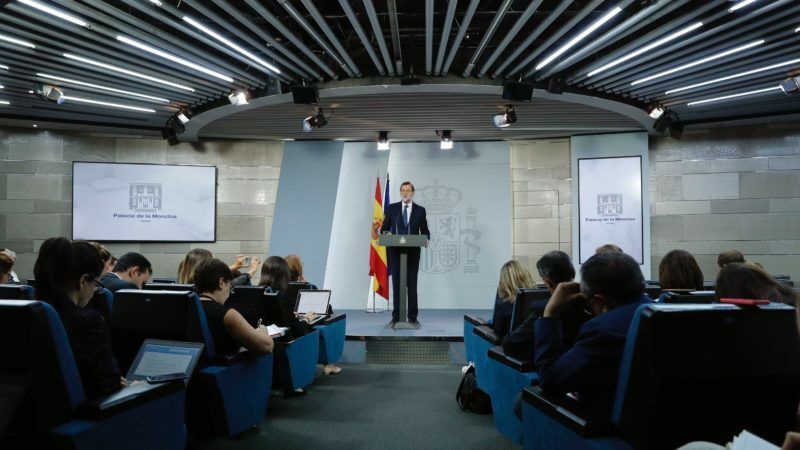 The leader of the opposition Socialist Party, Pedro Sanchez, said meanwhile that his side and the government had agreed to study a possible constitutional reform to try to end the crisis. The debate would focus on “how Catalonia remains in Spain, and not how it leaves,” Sanchez told reporters. While separatist leaders say 90% of voters opted to split from Spain in the October plebiscite, less than half of the region’s eligible voters actually turned out. Catalonia’s drive to break away from Spain has raised concern for stability in a European Union still coming to terms with Britain’s shock decision to leave the bloc. The EU on Wednesday urged “full respect of the Spanish constitutional order,” with European Commission vice-president Valdis Dombrovskis saying the bloc was “closely following” the developments. Crowds of thousands gathered outside the parliament building in Barcelona on Tuesday ahead of Puigdemont’s speech, waving Catalan flags and banners and shouting “democracy” in the hope of witnessing history in the making. But Spain’s political establishment rounded on Puigdemont following his declaration, and support among separatists in Catalonia was mixed. Barcelona resident Maria Rosa Bertran said she was against a delayed secession, which meant “suffering a longer agony. Indecision and uncertainty are the worst that can happen to us,” she told AFP. The government stuck to its stance that it would not accept mediation or any talks until Catalan leaders drop their independence bid. “Neither Mr Puigdemont nor anyone can expect to impose mediation without returning to legality or democracy,” Deputy Prime Minister Soraya Saenz de Santamaria told reporters on Tuesday. She said Puigdemont was “a person who doesn’t know where he is, where he’s going or with whom he wants to go”. 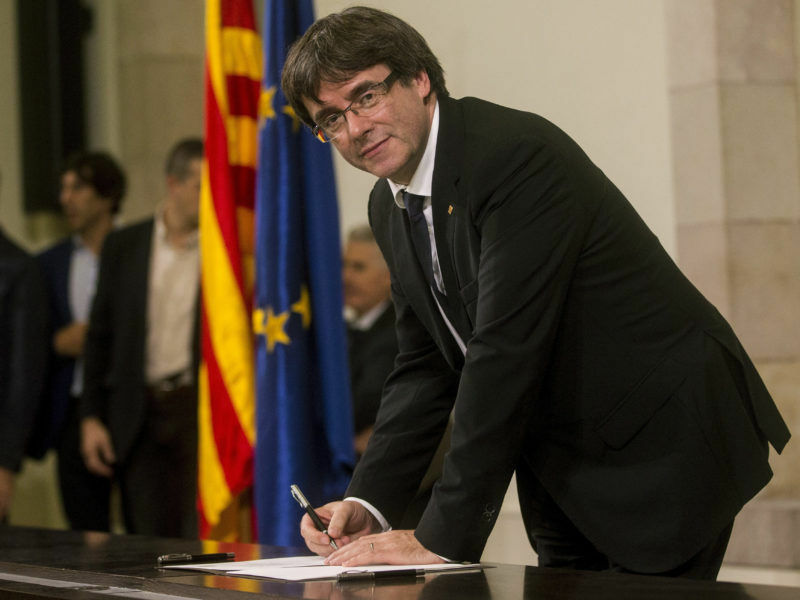 Following his declaration to parliament, Puigdemont and his allies signed an independence declaration outside the chamber, but its legal validity was unclear. Regional government spokesman Jordi Turull said the declaration was “a symbolic act”, adding that any official decision would need to be decided by the Catalan parliament. Madrid has consistently said independence is not up for discussion. “I did not expect independence to be declared today because of all the processes that the government of Spain has begun, both with police actions and with threats,” Marc Cazes, a student in Barcelona, said on Tuesday. 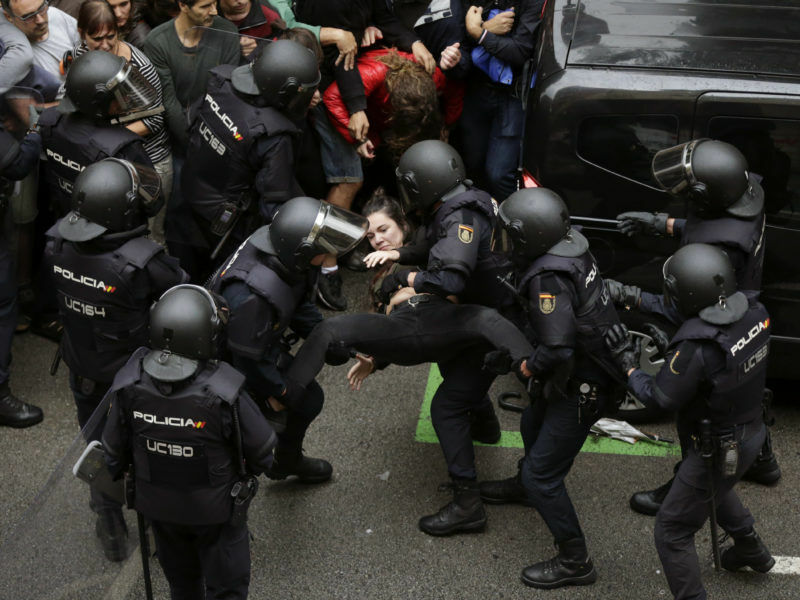 Police violence against voters during the referendum vote sparked international concern. In a carefully worded statement, the European Commission dismissed as “illegal” Catalonia’s independence referendum held on Sunday (1 October), only shyly mentioning the police violence that left some 800 people wounded. The crisis has caused deep uncertainty for businesses in one of the wealthiest regions in the eurozone’s fourth-largest economy. A string of companies have already moved their legal headquarters — but not their employees — from Catalonia to other parts of the country. The Spanish stock market was up 1.4% by midday on hopes for a breakthrough in the crisis. Demands for independence in Catalonia, one of Spain’s 17 semi-autonomous regions, which has its own language and cultural traditions, date back centuries. But a 2010 move by Spain’s Constitutional Court to water down a statute that gave Catalonia additional powers, combined with a deep economic meltdown in Spain, sparked a surge in support for independence. actually anarchy and political chaos reigns in Catalaunya . A good idea to retake control and re-establish the democracy back The games of Puigdemont’s blackmailing the whole gvernement and poeple of Spain like terrorists are doing should immediately end .